Florida seems to have a lot of bugs. Big bugs. That's why I live in the desert where we catch on fire if we stand outside longer than 30 seconds in the summer. I guess everyplace has it's pitfalls. Don't you have scorpions? Or have they all self-combusted? 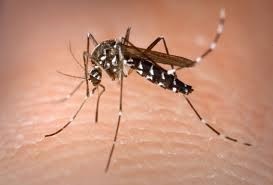 If/when I get to heaven, Ima ask God straight out: "The mosquito. WTF?!" It could only happen in Florida. Right? This is ONLY in Florida?